The new year kicked off in a good way for Coyote Music. Our #1 most-visited page was our own Submissions page. We have had new artists coming to us to help promote them at a pace higher than ever before in our 17-year history! 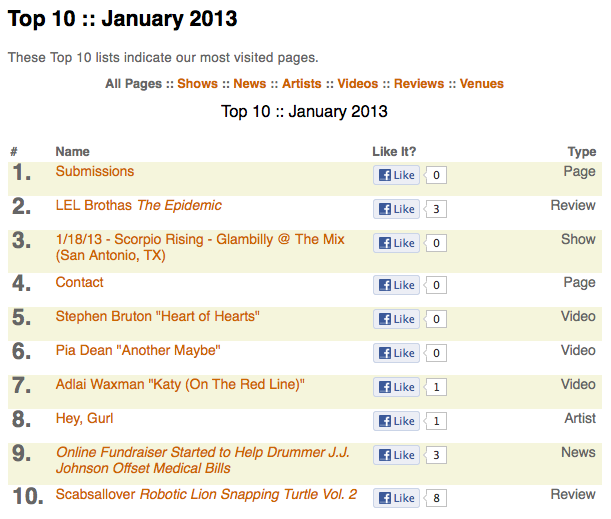 Our review of LEL Brothas' The Epidemic was also extremely popular throughout the month, in at #2. The most popular show of the month came in at #3, which was San Antonio's Glambilly hosting Austin's Scorpio Rising for a night of debauchery at The Mix in San Antonio. Catch the same pairing in Austin on February 23rd, when they'll be joined by Houston's Elbodo and DJ Boris at Austin's Metal and Lace (formerly Headhunters). 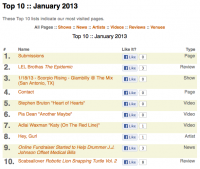 Our Contact page came in at #4 and the ever-popular video of Stephen Bruton's "Heart of Hearts" video was the 5th most-viewed page of the month. Two videos for heartfelt songs drew online attention. At #6, songwriter Pia Dean's "Another Maybe" (featuring vocalist Caroline Langford) makes its mark and Adlai Waxman's "Katy (On The Red Line)" stays in our Top 10 at #7. The Coyote Music Top 10 is rounded out by our Featured Artist, Hey, Gurl, at #8. Our announcement of a fundraiser for John Mayer's drummer, J.J. Johnson is no longer news but is our #9. And a review of Scabsallover's Robotic Lion Snapping Turtle Vol. 2. completes the list at a respectable #10.